Welcome to the PrestaShop Forum! Also, this is a good time to tell you that many of the questions that you will come across in the process of creating your store, have already been answered by our amazing Community members in these forums. I encourage you to search for your doubts before creating a new thread, because the answers to your same questions may be only a click away. I am also here for you, on behalf of PrestaShop, so if you have any questions, feedback or just thoughts on ways we can improve, please do not hesitate to contact me. I wish you all a very successful journey with your PrestaShop Online Store. New video is available for the 1.7 version! what software did you guys use? Hi, I've downloaded the Prestashop but I can't follow the next step to instillation as I can't find MySQL in my squarespace website. My admin panel looks nothing like the C panel in the tutorial. Do you or anyone else know how to install Prestashop to squarespace please? Can't wait to test the great features ! after install compleated , it should change the /admin folder to "newadmin name". did not change the name. ? then clicked to go to backoffice , and a blank page shows. clicked on store front , and everything is fine. cant see anything on admin page, blank. when do we change the permissions, before the install or after the install finished. ??? Happen the same with Prestashop 1.6.0 I already try that version too. I have experience on Linux apache and php, but with that error I not have idea About. I am trying to install free module from Prestashop addons market place in my store's back office. But the problem is I don't even see the tab to connect to Prestashop Addons. I am using Prestashop version 1.6 and am newbie for this. Download and unszipp the files on the computer or a webserver? I am a web developer and have been looking for a good alternative to Shopify and Woocommerce for my clients. 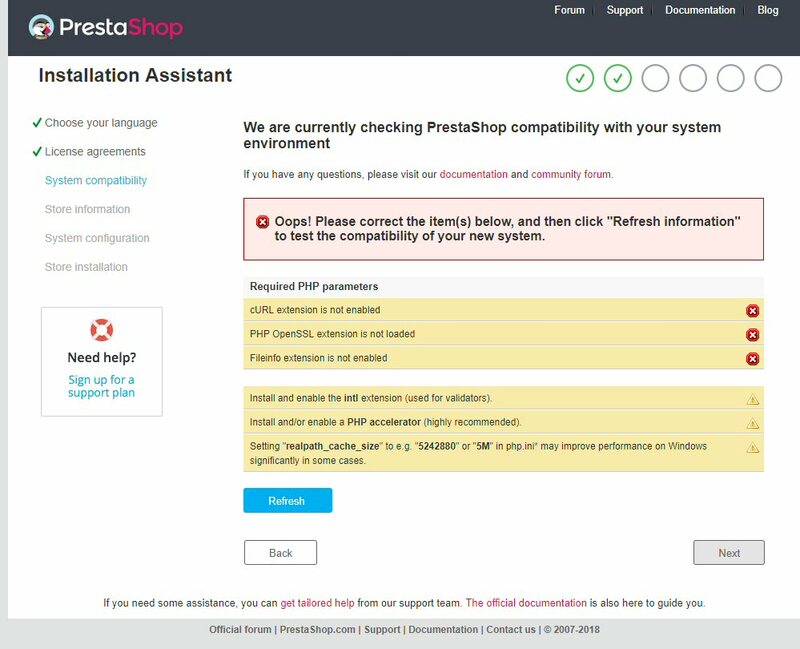 I like PrestaShop from what I see, however I had my IT guy try to install it and it won't install. We get to 25% and it hangs. We have looked though all the forums and blogs and we see tons of people having the same issue. We have tried all of the posted solutions with no luck. I need to know if you are going to fix this issue anytime soon as there is no reason that it should not be able to install on a Linux server using the latest version of Centos and Apache under mySQL. I look forward to your speedy response and solution to this issue. I bought out a company who used prestashop and gave me super admin access to their backoffice. How do I change everything over from their server to a local server. They were a small company and are not very familiar with the web stuff. An error occurred during installation.. If i see in phpmyadmin, i have some tables, but in 12% crash. all permision are checked to Select , Insert, Update, Delete,Create,Drop,Index,Alter. I try many times and same. Some idea ? Many thanks for installation video for 1.7 version. I was doing unzip manually when installation version 1.7 and facing problems. This video help me to know feature which unzip prestashop 1.7 zip file automatically. I am looking for documentation link for enabling php accelerator on my ubuntu and xampp local server. I"ve been trying to upgrade from 1.6.1.5 to 1.6.1.18 all week with errors.. finally decided to wipe everything and install 1.7.3 to avoid any upgrades needed in the near future... still can't get it to work.. it does not automatically unzip.. So I'm trying to install it on a local server using devserver17.. It DID unzip but I get these errors and have NO idea how to fix them.. any ideas or guidance, documentation, anything? Can you do tutorial for ubuntu 18.04 LTS ? hello can you make a tutorial for Ubuntu 18.04 LTS? I did not know how to do it.